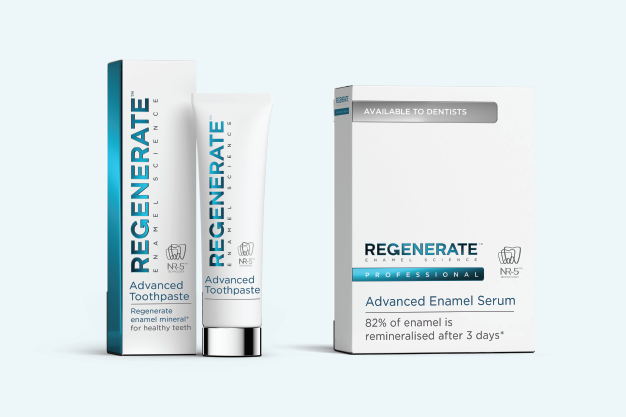 UNILEVER LAUNCHES AN IN-CLINIC REMINERALISATION REGIME WITH REGENERATE™ PROFESSIONAL ADVANCED ENAMEL SERUM. 82% ENAMEL MINERAL REGENERATED* AFTER 3 DAYS. Erosive tooth wear is a common and increasing prevalent problem which affects people of all ages. However a recent study showed that in the UK, 54% of young adults (aged 18-35 years) have significant tooth wear. Enamel erosive wear is a cumulative process triggered by repeated acid attacks, and the steep increases have been attributed to a rise in ingestion of fizzy drinks, sports drinks, fruits and juices, vinegar based dressings, wines and cocktails. This daily assault on the teeth is most common in the younger generation for whom drinking, snacking and grazing takes place perpetually throughout the day. Until now there has been little the clinician can do to help patients reverse the early signs of erosive enamel wear. However a new remineralisation regime, which is initiated in-clinic, has now been launched by Unilever. Kick start enamel remineralisation in-clinic. The process starts by making custom fit or stock dental trays for the upper and lower arches in the practice. These are used to apply the first of three applications of the REGENERATE™ Professional Advanced Enamel Serum – which takes only three minutes. The remaining two serum applications are completed at home by the patient over two subsequent days. Patients are advised to combine this with twice daily brushing with REGENERATE™ Enamel Science Advanced Toothpaste for best results. It is recommended that the Advanced Enamel Serum is used on a monthly basis. Inspired by bone repair research, NR-5™ technology contains two powerful ingredients - calcium silicate and sodium phosphate salts - which combine to form a fresh supply of enamel minerals, wrapping and integrating onto the teeth. There is a wide range of patients who can benefit from the new REGENERATE™ Professional Advanced Enamel Serum regime. Patients who have adopted healthy lifestyle habits (frequent citric fruit snackers, hot lemon water drinkers), those with active lifestyles who consume frequent sports drinks and those who are fizzy drinks devotees. Another large target group are patients who are undergoing in-clinic treatments where some enamel wear may occur; e.g. tooth whitening, orthodontic procedures and those undergoing prophylaxis. A third patient cohort is comprised of those who have other medical conditions which may lead to enamel erosion, because of high concentrations of acid in the mouth due to reduced salivary flow. These include patients on certain medications for blood pressure and depression, and patients with bulimia or acid reflux. Unilever has developed supporting practical materials for the Dentist to diagnose enamel erosion including the BEWE Assist Guide along with patient educational materials. To purchase REGENERATE™ Professional Advanced Enamel Serum for the dental clinic please contact CTS Dental Supplies on Tel: 01737 765400 or email: regenerate@cts-dental.com.